Explore your creative side! Art classes for beginner through advanced students of all ages. No classes from May 26th to June 1st but the studio will remain open for registered students. ​EARLY BIRD SPECIAL: Sign up before March 17th and receive a $20 gift card to our café or studio store. ALL CLASSES ARE BUY ONE, GET ONE 30% OFF FOR ONE STUDENT. USE CODE: SUMMER2019 AT CHECKOUT. Students will discover their inner creativity and whimsical nature as they are led through the basic and advanced skills needed to produce their own masterpieces with canvas and paint. Experienced and beginner students alike will practice and develop their own skills and art style with assistance from the instructor. This class encourages students of all skill levels to explore a multitude of techniques that can be applied to sculptural or functional ceramics. Through one on one guidance from our experienced sculptor, students will become comfortable applying the methods to their own work through this technique-driven class. This class is for sculptors of all skill levels. Beginners will receive one-on-one instruction as they dive into the basics of figurative sculpture. Advanced students will work on projects of their own choice with guidance from the instructor. Students of all levels are welcome to join this class. 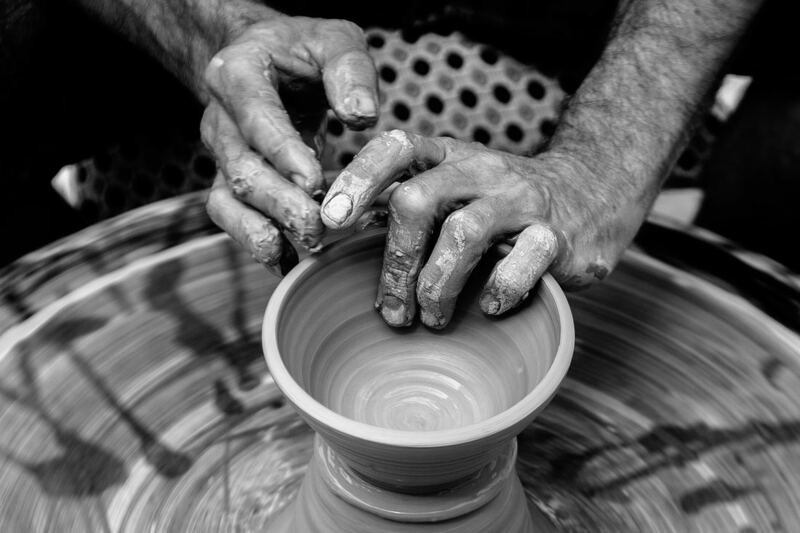 Beginner students will learn the basics of wheel throwing to create beautiful vessels. Experienced students will continue to develop their own skills and processes with assistance from the instructor. Previous wheel experience is preferred, but not required for this dynamic class. Students will focus on developing nuance and finish to their wheel thrown forms. They will gain confidence and hone their skills through each step of the making process as the instructor guides students through both assignments and self directed projects. Students of all levels are welcome to join this class. Beginner students will learn to construct functional and sculptural forms with traditional handbuilding techniques. Experienced students will continue to develop their own skills and processes with assistance from the instructor. Our classes are taught by experienced artists and educators. Many hold MFA and BFA degrees in Art, have received numerous awards, and national acclaim for their work and their pieces are on display in museums and private collections. Our instructors are dedicated to providing students with the skills necessary to achieve their desired goals in a relaxed and pressure-free environment. Marsha Van Vlack has been working professionally with clay for the past 40 years. Her work began with functional stoneware pottery and has since, transitioned into realistic sculpture and stoneware tiles. Marsha is heavily influenced by natural forms and her work has won numerous awards. She provides students with the techniques of construction and surface decoration and then allows them to move in the independent direction that the clay takes them. Linda Huey is a full time studio artist who makes pottery and sculpture. She enjoys teaching by giving encouragement in a non-judgmental way, exposing the students to as many influences as possible, helping with specific techniques that apply to their ideas, and emphasizing that mistakes can be very productive. Linda received a MFA in Ceramic Art from Alfred University and lives and works in both Alfred, NY and Boston, MA. Her work has been published in numerous books and national magazines and is included in public and private collections. Renee Coombs is a whimsical artist based out of Canaseraga, NY. She attributes her artistic freedom to her childhood where she spent her time romping around the countryside. "I am a painter who loves to use color and I can't seem to contain myself. One of the things I like about myself is that I am not perfect and my artwork is not perfect. I really like my paintings when they don't make sense and I love to make people laugh when they look at my artwork." Margaret graduated from Alfred University with a Bachelor of Fine Arts Degree in Ceramics. She is currently an artist in residence at the Wellsville Creative Arts Center and her aim is to share hand building and sculptural knowledge as well as wheel-throwing techniques in ART:360. Looking to practice a specific skill or get some one-on-one time with an instructor? Are you a beginner looking to preview one of our classes? Try our private lessons, which can be catered to your needs as a student. Perfect for any age or level of experience. Stay in touch! For information about live music, classes, and special events.